Lee Dong-gook ((이동국?, 李同國? ); Pohang, 29 aprile 1979) è un calciatore sudcoreano, di ruolo attaccante. Arrivato al M'Boro (Premier League), le sue prestazioni sono così mediocri (2 gol in 29 presenze) che risulta trentesimo nella classifica dei 50 peggiori attaccanti che abbiano mai giocato in Premier League. Dopo essere stato in tanti club come il Pohang Steelers, Werder Brema, Middlesbrough, S.Ilhwa Chunmae e Jeunbuk è titolare fisso nella squadra campione coreana e nell'anno 2014-2015 diventò capocannoniere della massima serie coreana (K-league). ^ (EN) Tom Bellwood, THE LIST: The worst strikers to have played in the Premier League, Nos 30-21, in The Daily Mail, 8 ottobre 2009. URL consultato il 16 novembre 2014. (EN, DE, FR, ES, AR) Lee Dong-gook, su FIFA.com, FIFA. 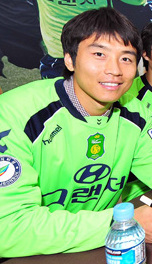 (EN) Lee Dong-gook, su national-football-teams.com, National Football Teams. (DE, EN, IT) Lee Dong-gook, su transfermarkt.it, Transfermarkt GmbH & Co. KG. Lee Dong-gook, su it.soccerway.com, Perform Group. Lee Dong-gook, su calcio.com, HEIM:SPIEL Medien GmbH. (EN) Lee Dong-gook, su sports-reference.com, Sports Reference LLC. (KO) Statistiche su new.kleaguei.com, su new.kleaguei.com (archiviato dall'url originale il 17 febbraio 2010). 1 Kim B.J. · 2 Choi S.Y. · 3 Lee L.S. · 4 Choi Y.L. · 5 Lee M.S. · 6 Yoo S.C. · 7 Kim D.K. · 8 Noh J.Y. · 9 Kim D.H. · 10 Choi Y.S. · 11 Seo J.W. · 12 Lee S.H. · 13 Kim T.Y. · 14 Ko J.S. · 15 Lee S.Y. · 16 Jang H.S. · 17 Ha S.J. · 18 Hwang S.H. · 19 Jang D.I. · 20 Hong M.B. · 21 Lee D.G. · 22 Seo D.M. · CT: Cha B.K. Kim P.S. 1 Kim Y.D. · 2 An H.C. · 3 Lee B.J. · 4 Shin D.K. · 5 Park D.H. · 6 Song C.G. · 7 Seo K.B. · 8 Chun J.H. · 9 Na H.K. · 10 Kim E.J. · 11 Seol K.H. · 12 Han D.J. · 13 Kim K.H. · 14 Kim K.I. · 15 Seo K.S. · 16 Ko B.H. · 17 Woo J.S. · 18 Lee D.G. · CT: Cho Y.J. 1 Lee W.J. · 2 Kang C. · 3 Ha S.J. · 4 Park J.S. · 6 Yoo S.C. · 7 Kim T.Y. · 8 Yoon J.H. · 9 Seol K.H. · 10 Noh J.Y. · 11 Lee D.G. · 12 Lee Y.P. · 15 Lee M.S. · 16 Kim S.S. · 17 Choi S.Y. · 18 Kim Y.D. · 19 Lee C.S. · 20 Hong M.B. · 21 Kim H.W. · 23 Park J.S. · 24 Park J.H. · 28 Choi C.W. · 30 Sim J.W. · CT: Huh J.M. 1 Kim B.J. · 2 Kang C. · 4 Seo D.W. · 5 Lee L.S. · 6 Yoo S.C. · 7 Kim T.Y. · 8 Noh J.Y. · 11 Ahn J.H. · 12 Lee Y.P. · 14 Yoon J.H. · 15 Lee M.S. · 16 Kim D.K. · 17 Park J.S. · 18 Hwang S.H. · 19 Lee D.G. · 20 Hong M.B. · 23 Park J.H. · 24 Seol K.H. · 25 Kim Y.D. · CT: Huh J.M. 1 Choi H. · 2 Park J.Su. · 3 Park J.H. · 4 Park J.Sub. · 5 Sim J.W. · 6 Kim D.K. · 7 Choi C.W. · 8 Ko J.S. · 9 Kim D.H. · 10 Lee C.S. · 11 Lee D.G. · 12 Lee Y.P. · 13 Park D.H. · 14 Kang C. · 15 Cho S.K. · 16 Kim S.S. · 17 Choi T.U. · 18 Kim Y.D. · 19 Song C.G. · CT: Huh J.M. Questa pagina è stata modificata per l'ultima volta il 18 apr 2019 alle 09:58.